Comic-Con attendees got to cool off at the San Diego marina today as IMDb hosted day two of their third annual #IMDboat at San Diego Comic-Con 2018. 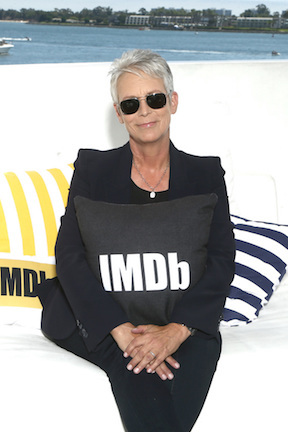 Jamie Lee Curtis, John Cena, Olivia Holt, Norman Reedus, Lauren Cohen, Danai Gurira, Jefferey Dean Morgan, Tara Reid, the cast of Sharknado, the cast of Better Call Saul, and more sat down for interviews with host Kevin Smith aboard the #IMDboat. John Cena and Jorge Lendeborg debated over who was the Megan Fox of Bumblebee. Meanwhile, Jamie Lee Curtis shared the cultural relevance of Halloween and its connection to the Time's Up movement. Curtis also shared the funny story about how she met and married her husband, Christopher Guest. Additionally, Norman Reedus and The Walking Dead cast shared their thoughts on Andrew Lincoln leaving the show, with each one giving him a special send off message. July 20, 2018 by Ian Sedensky.